K.H.A.A. are delighted to announce our opening lecture of 2019. 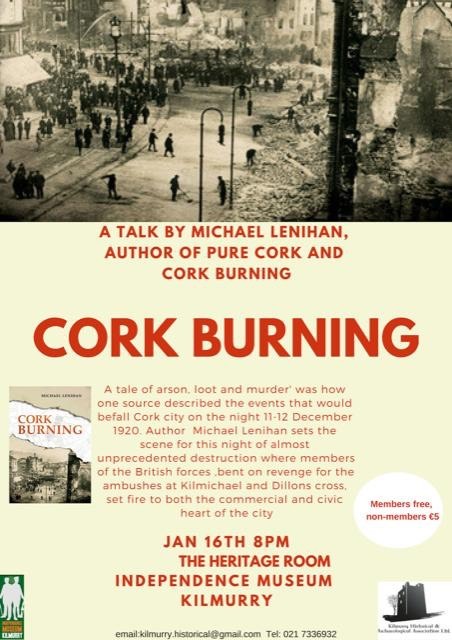 It is on January 16th at 8 pm and is titled Cork Burning.The talk will be given by Michael Lenihan. It covers such topics as Cork City before December 1920, the Black and Tans, Auxiliaries and K Company, Republican Cork, a timeline of events before the burning of Cork City, early fires and arson by crown forces in Cork, the Kilmichael Am bush, the Dillon’s Cross Ambush, premises destroyed, official investigations into the causes, compensation and rebuilding.